Casualties Mount in New Israeli Attack on Gaza | Democracy Now! We turn now to the Occupied Territories where at least three Palestinians have been killed and more than fifteen wounded in northern Gaza on the second day of a major Israeli offensive. The dead include a 70 year-old Palestinian man who was shot in the head by Israeli troops when he went onto the balcony of his home to take his disabled son inside. Eight Palestinians and an Israeli soldier died during clashes on Wednesday. The raid is one of Israel’s biggest operations since re-invading Gaza last June. Helicopter gunships fired missiles onto the town of Beit Hanoun, tanks patrolled the streets, snipers took up rooftop positions and troops conducted house-to-house searches. Both the Palestinian Authority President Mahmoud Abbas and the prime minister, Ismail Haniya, have described the Israeli military action as a massacre. Israeli forces have made regular incursions into Gaza over the past four months, following the capture of an Israeli soldier in late June by Palestinian militants. Since then, over 300 Palestinians–the majority of them civilian have been killed. Three Israeli soldiers have also been killed. We go now to Gaza to speak with Jennifer Loewenstein, a visiting research fellow at the Refugee Studies Centre at Oxford University. She is working on a book about the transformation of the national Palestinian movement. She joins us on the line from Gaza City. Jennifer Loewenstein. Visiting research fellow at the Refugee Studies Centre at Oxford University. She is working on a book about the transformation of the national Palestinian movement. AMY GOODMAN: We go now to Gaza to speak to Jennifer Loewenstein, a visiting research fellow at the Refugee Studies Centre at Oxford University. She is working on a book about the transformation of the national Palestinian movement. She joins us on the phone right now from Gaza City. Welcome to Democracy Now!, Jennifer. JENNIFER LOEWENSTEIN: Hi. Thanks for having me on. AMY GOODMAN: Jennifer, you last were in Gaza almost two years ago. How has it changed? JENNIFER LOEWENSTEIN: The situation, it’s very interesting. I mean, it’s kind of surreal. I was here in January, and it’s always sort of dreary in the wintertime. And I say that because you walk — you get into Gaza, and it’s this beautiful bright blue cerulean sky and this flowered foliage, and it’s gorgeous. And then, you look beyond that, at the city itself, and it’s absolutely crumbling, and there is trash in the street and destruction everywhere. I mean, buildings that have been bombed or simply falling apart out of disrepair. There are shops that are virtually empty. There are power cuts every single day. That was common, but not anywhere near as common as it is now. There are places where people have electricity for two or three hours a day only. That’s significant, particularly because you need to have electricity to pump water to the upper floors of these apartment buildings, and so a lot of people end up with absolutely no water for a number of days at a time. I’ve been here many times. In fact, I lived here in 2002 for almost half a year. And it’s never been normal here. It’s never been easy. But in all of the times I’ve returned to the Gaza Strip, I have not ever seen it look this collapsed, this exhausted. You see it not only in the buildings and in the appearance, the grayness and the crumbling appearance, but you also see it in the faces of people. And, you know, the Gazans, in my opinion, in any case, have been a very, very strong people and very defiant and persistent people. And yet, person after person that I’ve talked to this time has expressed real despair, real frustration, the belief that things are not going to get better, that this is not going to change. And it’s very discouraging to hear that and to see people with such hopelessness. AMY GOODMAN: Jennifer Loewenstein, how did you get into Gaza? How hard is it to be there? You are a visiting research fellow at the Refugee Studies Centre at Oxford University. JENNIFER LOEWENSTEIN: It’s extremely difficult to get into Gaza. I’m sure that the reason is because the Israeli authorities are keenly aware that when people see how it looks here, that it would automatically win sympathy in the outside world. So what’s interesting is that if I trace my ability to get into Gaza back to the year 2001, when I first came, it’s gotten progressively harder and harder and harder to get back in. In 2004, for example, it took me five days to get a press card from the Israelis, even though I had my own valid press card. But because I was an independent freelance journalist at the time, I was suspicious. And because I wasn’t working for a major Western and, I should say, sympathetic media outlet, I was given a lot of hassle. People from the Beit Agron , a press house in West Jerusalem, even called the Israeli consulate in Chicago, which then called contacts of mine in Madison to find out who I was and whether or not I should be let in. I shouldn’t say “contacts of mine,” but people I know. In that particular situation, I know from one of the rabbis in Madison, who told me sympathetically later on that the executive director of the Madison Jewish Community Center informed the consulate that I was dangerous and should not be allowed in. I was nevertheless given a press card the last two days I was here, so I was able to do something, but it was very little. Now, it is impossible for freelancers to come in at all. They have prohibitive fees, and basically the only people who can get in from the media are people who are full-time Middle East correspondents for a nationally recognized paper or station, such as the New York Times, the BBC, the London Times. These are the kinds of people who can come in. Other journalists have a great deal of difficulty. Now, this time, and I think this is also significant, the only way for individuals to come in is to receive some kind of sponsorship from either a United Nations organization or a well-known international human rights organization, such as Save the Children or Amnesty International. They are given clearance. So, for me, I started last April trying to apply to come in, and because I work as a researcher at an international organization, the Refugee Study Centre, UNSCO, the United Nations Special Coordinator’s Office, did agree to sponsor my research. That was in June, and so I came immediately. Nonetheless, when I arrived, it was on June 25th, the same day that Gilad Shalit was kidnapped, and as a result nobody got in, nobody for the entire week, except these quote/unquote “sympathetic” journalists. So I had to return now, because my clearance is up, as of tomorrow. And so, the hassle, the attempt to come in here is difficult for people to imagine. When I arrived in June at the Tel Aviv airport, I didn’t say anything to the woman behind the desk, where they check in all the passengers from the flights. I handed her my passport. She typed the number in my passport into her computer, and within seconds I was surrounded by Israeli security personnel, who said, “Come with us, please.” And at that point, I didn’t know if I was even going to be allowed into the country. I was detained, searched and interrogated over a period of six-and-a-half hours and had really no — nobody told me whether I was going to be let in or not. And at the end, I was simply escorted through the airport and let go, but only after asking questions and being completely given a body search and having every item of my luggage examined meticulously. AMY GOODMAN: Jennifer Loewenstein, we have only a minute to go, but this latest news right now out of Gaza, in this raid, one of Israel’s biggest operations since reinvading Gaza last June, at least three Palestinians have been killed, more than fifteen wounded in Gaza in the second day of the offensive. The dead include a 70-year-old man who went out on his balcony to bring in his disabled son. The deaths coming one day after eight Palestinians and an Israeli soldier died in clashes yesterday. Can you describe the situation? Are you able to get around to investigate? JENNIFER LOEWENSTEIN: Only to the extent that I’ve gotten to the hospital. I was in the Shifa Hospital in Gaza City yesterday, deliberately because of this incursion. And by the way, it was nine Palestinians yesterday. They are very careful about documenting things here. I went around, and with the permission of one of the head doctors at the hospital, photographed the wounded, because I know from being an American citizen that we don’t see Palestinian dead and wounded, we only see the Israelis. And so, I was taken to various wards in the hospital, where people were recovering, in particular, the intensive care unit, and photographed people with bullet wounds and with legs and arms bound up in plaster. And in one case, a man was simply bleeding from his belly. I mean it was just — it was really truly gruesome. And one of the people had died on the operating table that morning and was taken to the Kamal Adwan Hospital in Beit Hanoun, where they take the dead. There were lots of relatives hanging around the hospital, waiting for news on their relatives. And just as an aside, it was very touching, because, you know, you walk through these hospitals on a very hot and very humid Gaza day, there is no air conditioning, there are no proper bed linens. One father was shouting at one of the nurses that his son had been there a week — this was in another case — and had not yet had changed bed linens, and the doctor telling me, “Look, we don’t have them. We don’t have basic supplies like that. We don’t have dialysis machines for kidney patients. We don’t have cancer drugs. We can’t do elective surgeries anymore, such as for hernias or anything like that, because the more crucial or urgent situations have to take precedence.” They don’t have basic medicines for people with the flu and, you know, stomach upset. It’s just — it’s really a serious and deadly siege that’s been imposed on the Gaza Strip, and it’s having incredibly bad repercussions here among the population. 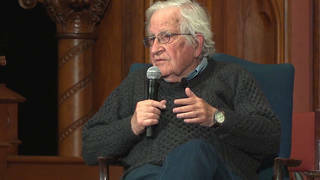 AMY GOODMAN: Finally, Jennifer, the Israeli newspaper Haaretz is reporting the Bush administration has undertaken efforts to arm and train the presidential guard of the Palestinian Authority chair, Mahmoud Abbas, in order to prepare it for a potential violent conflict with Hamas. Palestinian sources say the training started in August under the guidance of an American military instructor. Do you have any more information on this? JENNIFER LOEWENSTEIN: Yes, I do. And I think it’s another very important point. There’s no question that this is happening. Nobody is shocked or surprised to hear it. They all know it. They all tell me this has been going on for a long time. There are training camps set up by the U.S. in the West Bank near Jericho, where these security forces are being trained. And there is clearly a circle of people around Abbas, not necessarily Abbas himself, but around Abbas, people such as Muhammad Dahlan, who have never accepted the Hamas government itself in any case and have been provoking skirmishes since January, basically, between the two factions. What is significant, however, is that this group of people around Abbas has no popular support. In fact, their support has dropped even further, even more below the situation in January, when the election results came in and Hamas had gotten a victory, Fatah, of course, being defeated for the first time in its history. Nobody here wants a civil war. The people are against it. Everybody you talk to says, “No, it’s not going to happen.” But there’s no question that this particular force around Abbas, these people being trained by the Americans, could cause a lot of trouble. It simply won’t be something that reaches into the population, because there is simply no popular support, nor are there the grounds for a real civil war here. Nobody wants it. AMY GOODMAN: Jennifer Loewenstein, I want to thank you for being with us, visiting research fellow at the Refugee Studies Centre at Oxford University, currently in Gaza City, where she is speaking to us from.